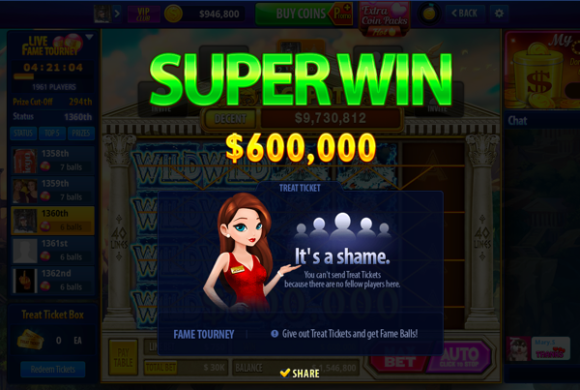 There have been a lot of new slots games this year, but none are as glamorous as Take5 Free Slots. This game claims to provide a completely unique approach to gaming. 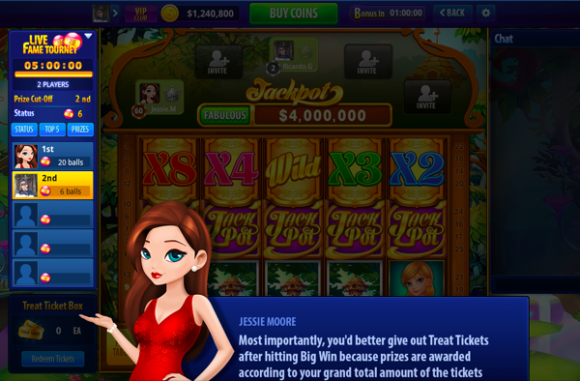 By putting players first, they have created an app that caters exclusively to slots enthusiasts. According to fans, Take5 Free Slots is absolutely packed with surprises. These extra features have made the game a hit, & they have amassed over 100,000 monthly players. This small army of players swear that this game is stealing the show. To find out if the game lives up to the hype, we decided to explore this new release. During an hour of intense gameplay, we immersed ourselves in every aspect of the game. From there we were able to create the most in-depth review online. Prepare to be blown away by this article, it covers the inner workings of this release! This odd intro won me some much needed coins. As soon as the game started loading, the screen was consumed by a message wishing everyone Happy Mother’s Day. This was a nice touch, but I was only interested in the game. As soon as the game loaded, I was given a million credits! This was plenty to start spinning, so I tried to make it to the lobby. Before I knew it I was thrown into an interesting Live Fame bonus tourney! This won me 3,000 credits, but I was itching to play some slots. This epic win was a welcome surprise! 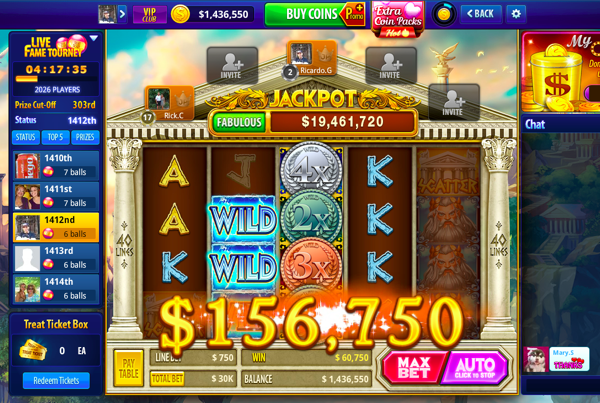 After a long struggle, I finally made it into a Greek themed slot game. The way they ushered me into this level was bizarre, since it didn’t give me the option of picking which level I entered. Either way, I was happy to finally play some slots, so I started spinning. The first few spins were uneventful, but before long I won 600,000 credits! This was yet another impressive win! Emboldened by this victory, I dove back into the slots. Once again I achieved only minor wins on the first few spins. The amounts rotated from 5,000 to 25,000, which were quite modest given the fact that I was betting 30,000 a spin. 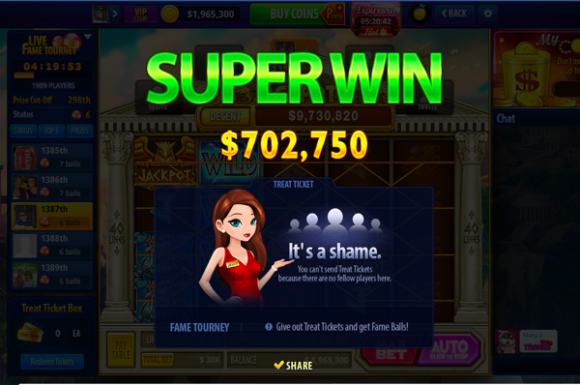 Just when I thought that I needed help, I ended up winning 702,750 coins! This put me back in the game, so I started spinning with a renewed passion. They need more of these bonus games! After a few lackluster spins, I was beginning to become disenchanted with the game. The only thing happening was winning spins, which gets repetitive surprisingly quickly. Just when I was about to quit, I was thrown into Zeus’s Furious Lightning Storm! 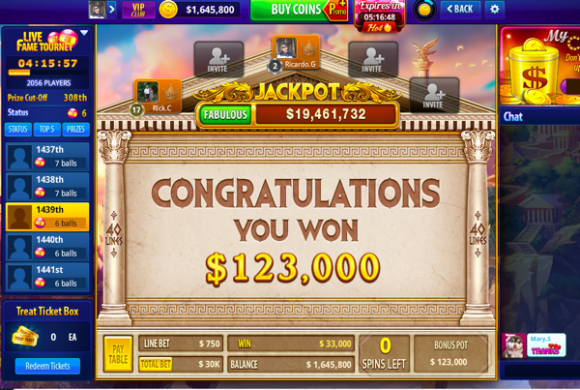 This bonus game gave me some electrifying free spins, & by the end of the round I had won 123,000 credits! This was a great surprise, but it still wasn’t enough to save the game. 10 minutes after this bonus I was still inundated in repetitious small wins. They ended up becoming too easy to predict, so I ended up quitting while I was still ahead. Take5 Free Slots is an action-packed game, but it lacked enough depth to keep us playing. While the graphics are great, the game’s setup is surprisingly confusing. There’s no clear-cut lobby, so players end up getting hurled into random slots games. While this isn’t a crime, the lack of diversity within their levels is the real deal breaker. The best players can hope for is a big win, but at 30K a spin those winnings disappear fast. This game has a lot of potential, so hopefully their developers upgrade it with more surprises!